Yesterday, I drove nearly 250 miles — first from Flagstaff to Leupp and back and then from Flag to Tuba City and back. In total, I was gone about 9 hours and every minute of was worth it. 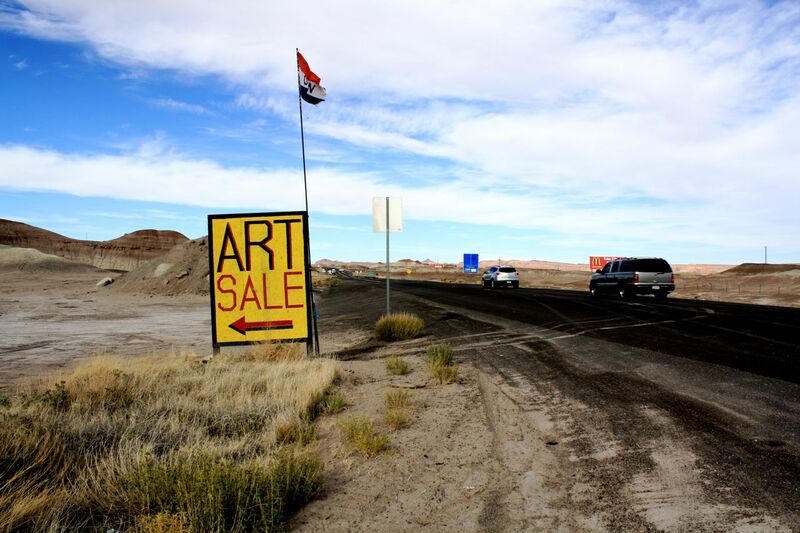 The purpose of my trip to the Navajo Nation (Naabeehó Bináhásdzo in Navajo) was to interview people about the Nation’s economy for an in-depth feature article I’m working on. What I got out of the experience was much more. Everyone I talked to was surprisingly optimistic about the future, in direct contrast to the crumbling infrastructure around them and the nearly 50% unemployment rate which I had expected to find was crippling them. What I consistently found was a hardy group of people determined to make ends meet and build something better for themselves and their children. I was privileged to meet Nash Myers, who gave up a job he loved in Flagstaff to help his wife’s family sell roasted, salted pinions and red chile tamales out of a cooler in the back of his red Ford F-150. It was too hard on his family for him to be commuting over 100 miles per day, so he gave up river running. Susan Gregg is retired, but likes to keep busy. So, with the help of a friend, she returned to a childhood fascination with stones and taught herself how to cut, grind, and polish semi-precious stones to make her own jewelry. Susan was eager to talk to me. 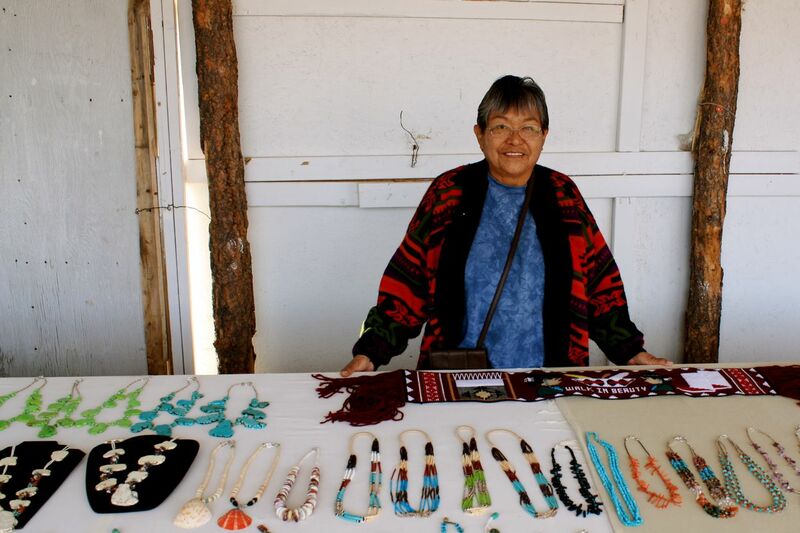 She was proud of her work and could tell me everything about every bead on every necklace in her booth — a simple row of plywood alcoves strung out along the dusty shoulder of U.S. Route 160, about 20 miles from anything. She tells me the name of each kind of rock, where she found it, what properties it is traditionally believed to have, and how she painstakingly crafted each one. She is an artist, and even keeps her beading kit beside her bed for those nights when inspiration visits her in the form of a dream. The resilience of the Navajo people is astonishing. The elders and young people alike know that times are tough, but refuse to be kept down or pigeonholed. They’re not waiting for anyone to save them. Their future is firmly in their own hands. Everyone I spoke has no doubt that better days are ahead. It is truly an inspiring sight to behold. As I drove home in the gathering dusk, I was struck by one other thing — the twin peaks I have taken for granted for so many years. I can usually see them from most places in town, but it wasn’t until I was 80 miles away from the San Francisco Peaks (Dookʼoʼoosłííd in Navajo) that I saw how majestic they really are. They dominate the landscape as the largest and most beautiful mountains to be seen in any direction. The snow-capped slopes of the caldera are breathtaking, even from such a distance. I was mesmerized as I drove and eventually had to pull over to take a few photos. It’s easy to see why the thirteen tribes in the surrounding areas believe them to be sacred.